Image 4261612: Beautiful Lush Grape Vine In The Morning Mist and Sun with Room for Your Own Text on Blurry Vineyard Background. 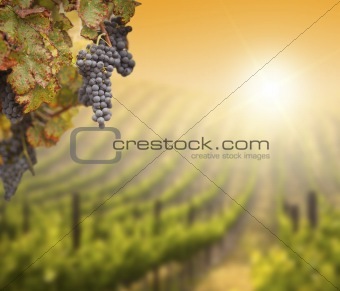 Image Description: Beautiful Lush Grape Vine In The Morning Mist and Sun with Room for Your Own Text on Blurry Vineyard Background. M 13.3 x 11.4 cm 5.2 x 4.5"
L 18.7 x 16.1 cm 7.4 x 6.3"
XL 22.9 x 19.7 cm 9.0 x 7.7"
XXL 32.5 x 27.8 cm 12.8 x 10.9"
XXXL 41.9 x 35.9 cm 16.5 x 14.1"